Have a wonderful weekend everyone. I will be back to regular posting next week, can't wait -- and thank goodness our internet is now working consistently again. Thanks for bearing with me. What a beautiful bouquet of flowers. So nice and springy on a winters day. ulips are my favorite flowers. Thanks for these beautiful photo! Lovely picture! Wishing you a happy weekend aswell! Can't wait for tulips, haaaaa...Bon week-end! Beautiful photo! They would be my favorite flower if they weren't so stinkin fragile. I guess that's part of their beauty though. 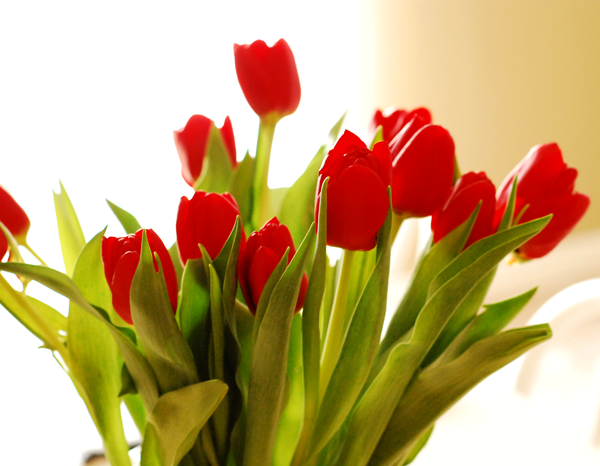 Tulips are my favorite! Thanks for the day brightener! Pretty tulips. I have a bulldog named Tulip.